Have you been feeling not quite yourself or just unmotivated? Are you in a funk and not sure how to get out of it? 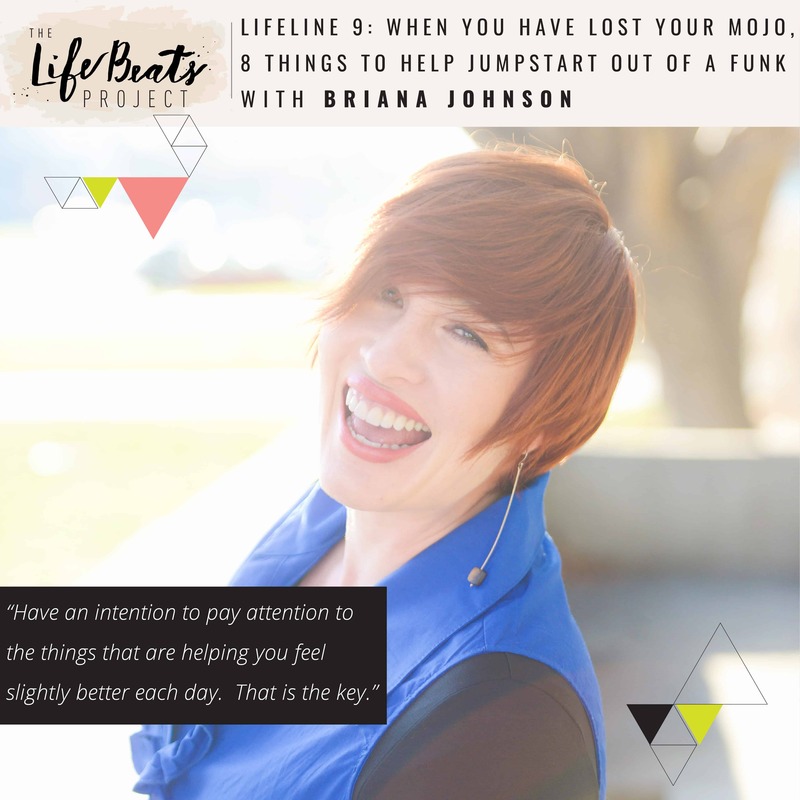 On this month’s LifeLine podcast episode, Briana shares an experiment that she did after feeling like she had lost her mojo and was ready to jumpstart out of a funk. She shares 2 things that didn’t work and 8 things that did work to get her on the path back to feeling like herself again. She shares the key to this experiment as becoming aware of your state and then paying attention to each thing that helps you feel slightly better each day, to transition from a subconscious existence of mundane, disconnection, and complacency to becoming actively conscious of those things that are reenergizing, satisfying, and self-affirming- however slight the improvement may be. Briana tells why this key works as explained by the Baader-Meinhof Phenomenon in which your brain draws attention to and helps you notice those things you want to see. Briana shares why at first this became more painful but how these eight things transitioned her on a path of returning to a fullness of living. Listen and be inspired to identify those things in your life that bring you connection to your health, your relationships, and to yourself, to help you achieve a feeling of fullness, energy, and self-satisfaction. First time to listen! Thank you! I get what it’s like to feel off. My second brain cancer surgery was nearly 3 weeks ago. Side affects of drugs make it worse. But as I improve and heal my filter and energy improve. Meg!!! Thank you soooo much for sharing your heart and for listening to the podcast. I can’t imagine what you are going through and the frustrations that must come with what you are experiencing. I am so happy to hear that you are improving and healing. You are a fighter! You can do this! So I know this was a like a month ago (! )…but I just wanted to add that I absolutely loved it! About 8 months ago, I took a huge step away from every form of social media because I too was feeling that flat-ness (and exhaustion) you mentioned in the podcast….and hoping that perhaps a little more introspection would help. I’m so blessed that this was first podcast to grab my attention on my (very slow) reintroduction to world of social media. It was so inspiring. And though I’m about two weeks too late…I’m definitely taking the non-challenge! Hugs! Casey!! Its so great to hear from you. I’d love to hear how your step away from social media felt and why you have decided to slowly return. I am so happy that you were able to find this episode and that you were inspired by it!! I’d love love to hear about your non-challenge/experiment. Will you let me interview you?